The white State Flag of Massachusetts has an image of the state seal which features a picture of an Algonquin Native American. Above the shield is the state military crest that depicts a bent arm holding a broadsword. The flag serves as a symbol of honor, heritage and regional pride and is displayed at state buildings. There is a strict Order of Precedence for flags. State Flags are displayed in order as they entered the Union. Car Flags are often displayed to represent of an individual's allegiance to their state. 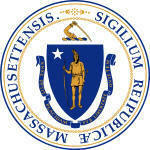 Massachusetts State car flags are used by their owners as mobile emblems of their home. Car flags are usually made from strong materials and are attached to a car via a pole and clip window attachment. What is the design of the Massachusetts state flag? 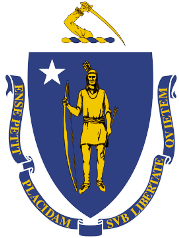 What does the sword symbolize above the Massachusetts shield? The sword image depicting a bent arm holding a broadsword is seen on the state military crest. The sword has its upturned blade reflects the feelings of the patriots of Massachusetts leading up to and during the fierce conflict of the War of Independence (1775–1783). What is the Native American image and symbolism on the Massachusetts shield? The white 5 pointed star symbolizes the state's admission as the 6th US State. Who designed the Massachusetts State Flag? 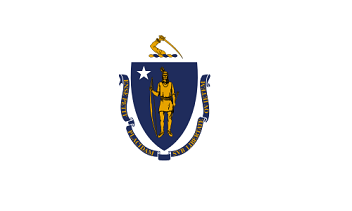 What is the history of the Massachusetts State Flag? 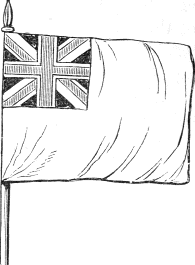 Massachusetts had an official naval flag during the Revolutionary War. It was was adopted in April, 1776 and had a white field with a green pine tree and the motto "An Appeal to Heaven"
The Massachusetts flag is kept and used as required by the code specified in the constitution of the state. Just to clarify the difference between Flags, Pennons (Pennants), Standards and Banners used in heraldry. What is a Flag? A Flag is a piece of cloth, usually rectangular, of distinctive color and design, used as a symbol, standard, signal, or emblem. Massachusetts Official Nickname "Bay State"